There’s no national holiday for any baseball player. That set me off thinking about today. 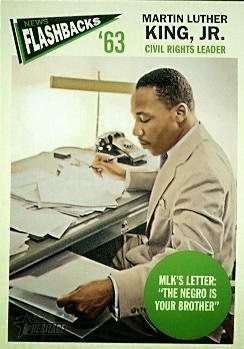 Martin Luther King Jr. never appeared on any trading cards during his lifetime. I’ve wondered if any King children have autographed his Topps cards? I must close with some applause for Ron Kaplan, a talented book reviewer. He crafted this insight about MLK and baseball in 2012. There are connections! Take a peek.